The sister city reception was a blast. 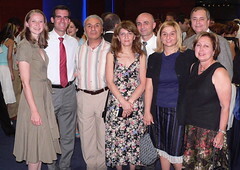 I'll blog it in detail later, but before I sign off from posting and get back to touring, let me just give a shout-out to the extraordinary group of friends with whom I've been traveling, who in this photo are flanking three new friends from the Yerevan Sister City Committee. On the left is my partner Amy Wakeland; on the right are my tireless deputy Baydsar Thomasian, my executive assistant Lynnette Amerian and her husband Bruce Bogstad. (All of them, I should note, are paying their own way—your tax dollars are not involved in this trip.) The journey wouldn't have been nearly as exciting or refreshing without Amy and the rest of the crew. For a city surrounded on three sides by hills, the days linger for a surprisingly long time. It stays light until almost nine o'clock at night. On Thursday night, we went to the Artbridge Café for a Café Glasse (iced coffee with ice cream) and a bite to eat. There is a very vibrant contemporary art scene in Yerevan; Artbridge sells some excellent art for about a tenth the price of what it might go for in an Echo Park gallery. The café was sprinkled with Yerevan hipsters, students, and artists. I spotted a young Armenian woman who pulled off a surprising look, combining a sky-blue Britney Spears top hat with a Paris Hilton-style handbag-sized dog. One of the top projects that we have explored for possible collaboration between Los Angeles and Yerevan is between the city's respective film industries. One member of our delegation is talking to the Armenian government about the possible establishment of an Armenian Film Commission. The U.S. Embassy is involved with a project to restore valuable but deteriorating film archives here in Yerevan, which was an important locus of filmmaking in the early days of the medium. And the Silver Lake Film Festival asked me to keep my eyes out for new Armenian films that might be shown at next year's festival. I'm seeking other contact points for film exchange, too. Perhaps AFI or some other entity could connect to the restoration project, and I'd like to see if equipment donations could be arranged between studios and post-production facilities in L.A. and their Armenian counterparts. Garni Temple and Geghard Monastery both deserve entries in their own right, but until I have the chance to blog them properly, I'll refer you to their Armeniapedia links. Our real accomplishment of the day was when, hungry from touring, we came up short for lunch options, and our guide Zara and her young aunt Getzmadzin put together an impromptu post-tour feast for us. We all came back to their house, where Zara dipped next door to negotiate some home-made yogurt and cheese from her neighbors while Getzmadzin picked some choke cherries, black currants, and plums for us to try. One of the country's ever-present sweet and juicy watermelons was produced and quickly divided, and some fresh honey put out as well. The lavash was still warm as we greedily scooped up the yogurt and honey. Zara recommended combining the mild, feta-like cheese made from the neighbor's cow with the watermelon wrapped in the lavash for a swee-and-salty sandwich. It would have been rude for us not to take a bit of cognac, too, so we did so to chase down the stunning meal. Thanks, Zara and Getzmadzin! On the way back to Yerevan on Tuesday afternoon, we drove through Spitak, epicenter of the 1988 earthquake that leveled huge portions of central northwest Armenia. The earthquake occurred in the morning. Many people were at work. Students were in school buildings. The earthquake destroyed countless buildings, burying their inhabitants. It killed more than 25,000 people. Foreign assistance helped rebuild Spitak. As you drive through the town, you see that one of the best-kept and newest cities in Armenia has emerged from the tragedy. We stopped at a church built in the Armenian traditional style, with one exception. 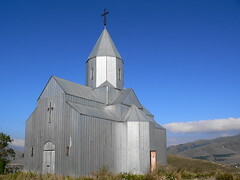 Draped in uncharacteristic steel siding, the church was erected in about 45 days. The accelerated timetable was necessary to accommodate the thousands of funerals for Spitak's earthquake dead. Surrounding the church are tombstones in the traditional Soviet style, with pictures of the deceased etched into the stone (a feature now seen widely in Los Angeles, for example at the Hollywood Forever cemetery in CD13). The church is now abandoned, with a rusty lock that looks like it hasn't been opened in years. Like much of Armenia, Spitak would rather look to the future than back at the sadness of its past. Lake Sevan is one of the highest freshwater lakes in the world and sits in the center of the Republic of Armenia. We stopped by Sevanavank, a monastery situated atop a peninsula that juts into the lake from its western shores. The peninsula was an island until the 1930s, when overuse of the lake eventually depleted its waters, lowering the water level by 19.5 meters and making a peninsula out of the former island. I ate some of the famous Ishkan Trout, found only in Sevan. Today, the trout is an endangered species; the trout we were served was a legal, farm-raised species. We drove through Ijevan and enjoyed a stiff cup of Armenian coffee before departing the city where the Soviet Army first entered Armenia in 1920. Passing close to the Azerbaijan border on our way, we saw some burned-out villages that had been Azeri exclaves in Armenia, bringing to mind the war that shook this idyllic landscape and did not now seem so distant. We crossed the border into the Republic of Georgia just after a motorcade that included the Georgian Defense Minister (who was on his way to visit his Armenian counterpart) crossed in the opposite direction. The afternoon after our visit to Khor Virap, we went to the Genocide Memorial in Yerevan. Built during Soviet times in response to demands from the local population that the USSR recognize the mass killings of up to a million and a half Armenians living under the Ottoman Empire, it has the clean lines, severity, and simplicity of many other Soviet monuments. And like many memorials, it is no less moving for its lack of adornment. The memorial features an eternal flame surrounded by twelve obelisks. The obelisks symbolize the twelve historical population centers the Armenian people. Together, Governor Dean and I planted a pine tree in a grove where elected officials from around the world have done the same in remembrance of the genocide. 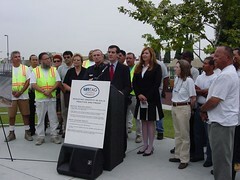 Onnik Krekorian's links have more about our visit to the memorial. 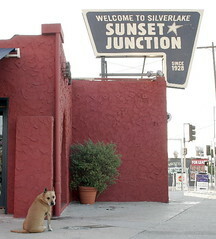 Don't forget that this weekend is Sunset Junction, CD13's premier outdoor festival of music and more (although there are challengers this year!). The list of bands is extraordinary as always, so come on out and join the fun. Armenians are proud that they were the first nation to accept Christianity as the state religion, in 301 AD (Georgia and the Roman Empire followed later). Saturday we set off to Khor Virap, in the shadow of Mount Ararat, where St. Gregory the Illuminator first brought Christianity to Armenia. Around 288 AD, King Trdat III threw Gregory in a pit at Khor Virap with the intention of killing him for his Christian proselytizing. For thirteen years, Gregory lived in this pit, fed by the king's sister, and living by little more than his faith. Finally, in 301, Gregory cured the king of a terrible disease (in more extreme versions, he turned into a boar after killing two nuns), and the king accepted Christianity and adopted it as the state religion. Our delegation went down into the pit, which has been preserved all of these years. A 17th century church (very modern by Armenian standards) sits atop the pit, but on a summer day, it is a pretty miserable place to be. Thirteen years down there is unimaginable. The Armenian Church is neither Eastern Orthodox nor Catholic, but is a separate branch of Christianity with its own Catholicos (or pope) and liturgy. Saint Mesrop developed the Armenian alphabet in order to spread the Christian Gospels to Armenian-speakers. This was the first of many ancient sites we are to visit, in a country where a 12th or 13th century church is hardly old. Meeting with the mayor of Yerevan the day before, I told him that Los Angeles would celebrate its 224th birthday in two weeks, to which he replied that Yerevan celebrates its 2768 birthday this year. Kind of puts things in perspective. Remember how we had a luggage mix-up at the airport? The suitcase with all of my business clothes never made it to Yerevan. Someone lent me a suit that, despite being a few sizes off, was sufficient for the task at hand. The Friday that we arrived was full of meetings: with the Deputy Foreign Minister, with members of the ruling coalition and of the opposition in Parliament, with a legislative friendship association, and finally with the Mayor of Yerevan, Yervand Zakharyan. The meetings were all very encouraging about establishing a Sister City agreement with Yerevan and using the Sister City relationship to promote economic, cultural, and political interaction between the two municipalities. DNC Chair and former Governor Howard Dean, whom I had invited to come to Armenia earlier this year, joined us for some of the meetings. 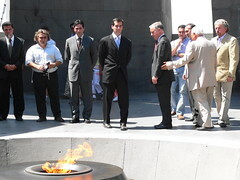 His focus has been on American foreign policy towards Armenia, especially on the issue of the Armenian genocide. We visited Mayor Zakharyan in the gleaming new Yerevan City Hall, one of the most beautiful buildings in the city. 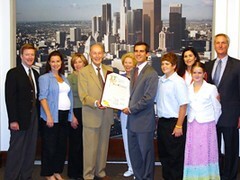 The mayor agreed to sign the agreement to form a Sister City relationship with Los Angeles. We spoke about emerging industries in Yerevan and throughout Armenia and about links to with Los Angeles companies. We looked at cooperation on the issues of law enforcement: a criminal wanted by the LAPD was arrested in Armenia just before we arrived. And we explored possible cooperation around seismic standards for buildings, considering we both live with fault lines in and around our cities. The State of California is establishing a trade office in Yerevan, and we are looking at possibly co-locating our Sister City initiative with them in order to enhance some of their economic projects in Armenia. It was a very productive day, and tough too—these meetings all took place between about 11PM and 5AM Los Angeles time. We had a great meal at an outdoor restaurant alongside the river with officials and our hosts and took in some jazz in one of Yerevan's vibrant outdoor cafés before calling it a night. I've been shooting a good deal of pictures from Armenia, more than I am posting directly on to the blog. You can see my Armenia photo set here and watch it as a slideshow here. Also, please know that as connected as I am, there is something of a time lag between my trip and my blogging. If a lot of posts all show up at once, they are probably drawn from events of a few days in a row. I'll try to keep you as updated as possible, do the work I came to do and enjoy the trip as well. Enjoy! When dawn broke over Yerevan last Friday morning, the city came into full view for the first time. The center of the city sits like a wide stage in a giant amphitheater—open towards the west where Mount Ararat rises. 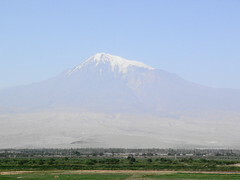 Mount Ararat, where Noah is said to have waited out the flood in Genesis, has a central place in the heart of the Armenian nation. It is the tallest mountain in the land where Armenians have lived for millennia, and it rises above the Anatolian plane of Asia Minor with a drama surpassed by few other mountains in the world. There is a year-round snowcap at the peak; the Armenians call it the bridal veil. The mountain's rise from the fields below is so sudden and steep that the veil looks like a cloud sitting above the summer haze. 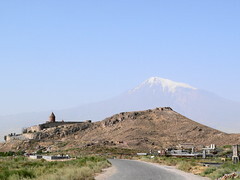 That Ararat now sits across the Turkish border makes this mountain also a symbol for the lost culture of Western Armenia. With few exceptions, Turkey prohibits tourists from traveling to the mountain. Cut away from the nation's boundaries, the mountain is as unreachable and omnipresent as a phantom pain, standing in for the suffering of Armenia's last 120 years. The poetry, music, and culture of the past invoke its greatness, while the current situation reminds the Armenian nation of its lost glories. I am pleased to say that the last of the Riverside bus benches has arrived and been installed by the BOSS (Bureau of Street Services). 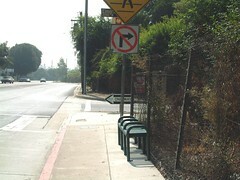 There are now 5 benches at each of the MTA bus stops along the west end of Riverside Drive (at Birkdale, Dorris, Riverdale, Harwood, and Elmgrove) that serves as the gateway to Elysian Valley. Funded with $22,000 in Street Furniture Funds, this simple improvement has garnered my office some of the most sincere thanks. I've always said that you can't afford to look to the stars if you don't keep an eye on the cracks in the pavement. Sometimes the most important thing municipal government can do is to make a place for folks to sit down. Big thanks to Lance Oishi & Sandy Nikaido of the BOSS, and the Elysian Valley Riverside Neighborhood Council. Onnik Krekorian left some useful links to posts about our trip on the Oneworld Multimedia Blog in the comments section at my personal blog. See "Dean Vows Support For Genocide Recognition" and "Yerevan and Los Angeles To Become Twin Cities?". In the photograph (by Mr. Krekorian), I joined Governor Dean and Giro Manoyan from the Armenian National Committee in Tsitsernakaberd, Yerevan to plant a tree in memory of the 1.5 million Armenians who perished in the Armenian genocide. On early Friday morning, after an exhausting 23 hours of travel, we touched down exactly halfway around the world from Los Angeles in Yerevan, Armenia. (Since Yerevan is twelve time zones from Los Angeles, I didn't have to change the time on my watch!). At the airport, a television camera waited for us until 3 in the morning, and there was a table set out with fresh fruit and cognac (I opted for the former, considering the hour). While British Airways lost two pieces of our party's luggage, we were mostly intact. I did a quick interview with the television camera bringing greetings from the world's second-largest Armenian city—Los Angeles—and setting out our trip's goal of establishing a Sister City relationship with Yerevan. It was no easy feat after almost a day of travel. The Yerevan airport is an architectural marvel—it is like a giant octagonal beehive, with arrivals in the center and departures leaving from above. Built in Soviet times, it is a cement sculpture. The airport is currently expanding and the operations are being handed over to a foreign company in an ongoing wave of privatization. On the way into town, we saw many casinos with names like Caesar's and Hollywood Casino, which we learned have been banished from the city center to the outskirts of town. On the road from airport, they have formed a kinda Yerevan Strip. We also passed the brand-new American embassy, built on one of the biggest pieces of land of any American embassy abroad. It was impressive. We drove through the city center in the waning hour of the night, but its stateliness was easily apparent—a seemingly well-planned center, with a real European feel. There were cafes everywhere, some folks were still out at 4am roaming the wide boulevards, and there was a video screen up where the statue of Lenin once stood in the main square. 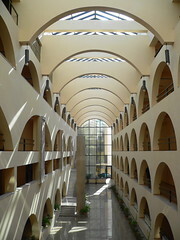 We settled into our hotel and prepared for the next day's meetings with government officials and Yerevan representatives. August's e-News has been sent out and is available online. If you didn't receive it by e-mail, why not sign up today? Regular readers of the blog will be familiar with some of the updates, but there's always more news in the e-news than makes the blog, especially in your neighborhood. The Atwater Village Farmer's Market takes place every Sunday from 10 am to 2 pm in the Wells Fargo parking lot at 3250 Glendale Boulevard. It currently has six-month pilot standing, and if it gets a lot of community support it will become permanent. So please take advantage of this community access to fresh food and local farmers. The results are in. One year ago, Chief Bratton, Public Works Commissioner Cynthia Ruiz and I stood on the steps of Micheltorena Street School to kick off our ambitious anti-graffiti program for CD13, UNTAG: Uniting Neighborhoods To Abolish Graffiti. We were joined by dozens of neighborhood activists who were frustrated by seeing the same tags go up on the same walls week after week and wanted to do something about it. Together, we pledged that in two years time, we would lower the amount of graffiti in CD13 by 50%. I had been inspired by the example of Ron Gonzales, the mayor of San Jose, CA, who had remarkable successes lowering graffiti in San Jose. However, when my staff spent a day driving CD13 block by block to count tags, we found densities of up to ten times the graffiti found in San Jose. Still, we had our base number (20,763 tags in the 13.13 square miles of CD13) and we knew what we had to do to bring that number down. The key to our success was our recruitment of block captains. Starting with the thirty or so people who signed up at our kickoff, we reached 100 block captains, people who took responsibility for reporting any instances of graffiti to our paint-out crews, either by calling our office directly or by using 3-1-1. We also won funding for security cameras (PDF) to be placed in parks such as Lake Street Park, whose brand new skate park, recreation center and playground had all been marred by acts of vandalism in the first months of its young existence. A year after our initial benchmark count—a year in which constant, block-captain-driven graffiti reporting had substantially increased the workload for our paint-out crews, Central City Action Coalition and Hollywood Beautification Team—my staff and I drove the district once again, counting tags with the same methodology we had used a year before. The results were astonishing. The entire day turned up only 7,970 tags: a 62% reduction in only one year. Jocelyn Geaga-Rosenthal, a block captain from Historic Filipinotown, captured it best at the press conference announcing the results when she said, "Fighting graffiti is like brushing your teeth. You have to do it every day to see results." She added: "But now my neighborhood has a great big smile." UNTAG did the job with neighbors' engagement, smart police work, and real care. Let's keep up the momentum of reducing graffiti. Won't you become a block captain (PDF) today? 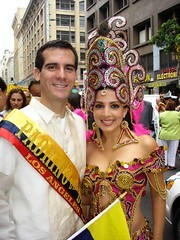 I rode in Sunday's Ecuador Independence Parade with my colleague Councilmember Jan Perry. Miss Ecuadors past and present abounded; Jan also brought them in to Council on Friday. There is a very active Ecuadorian community in Los Angeles, and some of its best restaurants are in CD13. 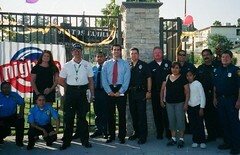 Glassell Park's National Night Out was a terrific success. The community decided early on that it wanted to develop its own organic version of National Night Out, and community members struck out on their own. I was pleased to attend the event, meeting at Juntos Park (pictured) and seeing the great participation from LA Bridges, our gang intervention program (they must have had 30 people there!) and Fire Station No. 50, who led the parade with their engine and played games with kids in attendance. 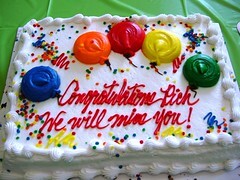 Congratulations to all who attended. The picture says it all. Good luck across the street! Governing magazine has an interesting article about blogs in the Texas statehouse. In addition to the political commentators who keep an eye on the Legislature from their computers or even from the visitors' gallery, I noticed that Texas State Representative Aaron Peña writes A Capitol Blog. He joins California's Assemblymember Paul Koretz as electeds with blogs (he and Koretz even share the same template. What are the odds?). Are there any other elected officials whose blogs you read? Or in this case, down. The green is on the ground at the Sunset Junction Triangle park and it looks great. 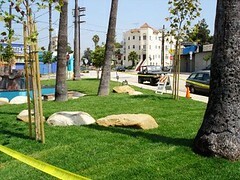 The park at the corner of Sunset and Edgecliff has beautiful new turf, fine sycamore trees, and handsome boulders. 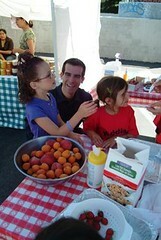 To get a nice feel for the new park, why not pay a visit to the Silver Lake Farmer's Market on Saturday and enjoy it. My office and I had a great time working with the beautification committee of the Silver Lake Neighborhood Council to complete this handsome touch-up to Silver Lake's snappy Sunset shopping district. The Housing, Community and Economic Development committee is no walk in the park. With oversight over the Housing Department, the Community Development Department and the Community Redevelopment Agency, the committee I chair must process hundreds of transmittals from those three departments and several others over the course of a year. The work includes approving city economic development projects, putting new affordable housing in the ground, issuing tax-exempt bonds, and helping fund non-profit organizations that serve at-risk youth, low-income families, and seniors; in addition to handling those individually, we have to set the overarching city policies that guide the conception and creation of those projects. To keep up, we meet once a week (most committees meet twice a month). And every decision that the committee makes is informed by the hard work of the staffs of the Chief Legislative Analyst and the City Administrative Officer, assisted by the City Attorney and City Clerk. To show our appreciation for this heroic but unrecognized effort, I invited the whole crew to join me for a mellow ceremonial lunch in Silver Lake. Thank you! 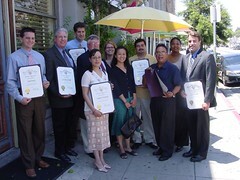 From left: Todd Bouey (CAO), Neil Blumenkopf (CA), John White (Clerk), Angelica Samayoa (CAO), Paul Smith (CLA), Meg Barclay (CLA), Bea Hsu from my own staff, Emilio Rodriguez (CAO), Robert Andrade (CAO), Lisa Johnson-Smith (CAO), Scott Eritano (CAO). Not pictured: Ivania Sobalvarrio (CLA). On the same day that we welcomed Stan Chambers to council, we said good-bye to Glen. I gave a short tribute to Glen's work in our office in my e-news letter from May 2005. The short version is this: CD13 is a lot more beautiful because of Glen's work on helping double the number of parks in the district, and it will get even more beautiful when Glen returns to his pre-CD13 career as a landscape architect. Good luck, friend. Safe to cross, stylish to see. 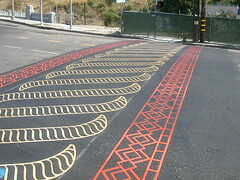 The new crosswalks at Temple and Hoover, installed by our Bureau of Street Services (or BOSS) are a first for L.A.: custom-designed patterns. This pattern is based on a traditional Filipino weave design. As part of the Temple Streetscape Project, the intersections of Temple and Glendale and Temple and Alvarado will get crosswalks over the next couple of weeks. Keep your eyes peeled for the crosswalks (and, as always, for the pedestrians using them). UPDATE: Thanks to Congressmember Xavier Becerra's good work on appropriations matters, the streetscape project has been funded with an additional $400,000. 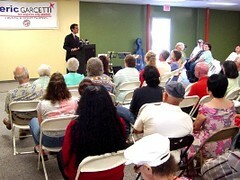 And Congressmember Becerra also won CD13 $1.12 million for badly needed street lighting in Elysian Valley. Thank you! Stan, family, colleagues and friends. Stan Chambers has reported more than 20,000 stories, every one for KTLA in Los Angeles. Beginning his career in 1947, he started reporting for television when there were barely 300 TV sets in Los Angeles, only half of them working at any one time. Over the following six decades, he covered natural disasters, riots, elections, and more; he covered the night in 1949 when four-year-old Kathy Fiscus stumbled into a well and was not recovered alive. He was on the scene to report heartbreaking, high profile stories from the Robert Kennedy assassination, the Frank Sinatra, Jr. kidnapping, the Manson family murder to Sharon Tate and the case of the Hillside Strangler. And he broke the monumental Rodney King beating story when amateur photographer George Holiday handed over his tape to him. He's covered almost every Rose Parade since 1949. He's got a star on the Walk of Fame, and a building on the Tribune lot in Hollywood bears his name. Stan was honored last weekend by the Society of Professional Journalists, and we were very proud to have the opportunity to present him with a certificate of commendation in council beforehand. Congratulations, Stan! Monday we opened a fabulous, unique new community space in at 3700 N. Verdugo Road in Glassell Park. This space-7,400 square feet comprising a senior center, a CD13 field office, a hot lunch kitchen and individual offices and storage spaces for the Glassell Park Improvement Association and the Glassell Park Neighborhood Council - is particularly special because, like no other public facility I know about, it's housed in a Public Storage facility, the colorful building that meets your eye as you exit the 2 freeway on Verdugo Road. After a rocky start in the community, Public Storage has become a great neighbor. When it wanted to change its operations, it sought community input as to how it could help the community as it shifted from an underutilized drop-off facility to a typical storage center. With great participation from local groups facilitated by my deputy Mitch O'Farrell, the vision for the multi-purpose center took shape. ...and cook up something to eat. The Glassell Park Seniors were tired of having to play an inadvertent dodgeball game with local youth everytime they met next door at the recreation center. 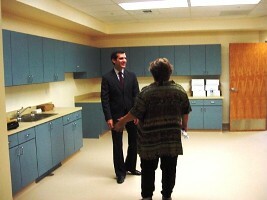 There weren't enough parking spaces or meeting rooms at that center to meet the growing community's needs. All these concerns factored into the design that has now been realized in a state-of-the-art public space where our the vital grass-roots organizations that make our democracy hum can meet, plan or argue the shape of their neighborhoods and our lives. Public Storage has given us the space for a 30-year, $1-annual lease. We'll make the most of it. A year ago, in preparation for the debut of my graffiti-fighting initiative UNTAG, I spent the day with my entire city hall and field staff driving every block of the 13th District, counting tags on buildings, sidewalks, utility boxes and nearly every visible space. On a single day in July, we counted 20,763 tags; that would be the benchmark against which we would gauge our success. A week later, I gathered with community leaders, volunteers, Chief Bratton and Public Works Commissioner Cynthia Ruiz to vow that we would cut the amount of graffiti in CD13 in half within two years. On Thursday, my staff and I went out into the field again, using the same counting methodology we used last time. Once the results are in and processed, we'll announce how far we've progressed towards our graffiti-reduction goal. My fingers are crossed. Stay tuned!